Margaret was the eldest child of Harry and Adie Ewart, her only sibling a brother called Harry Junior (nicknamed Boy) was born in 1926, was two years her junior. Her childhood was spent moving with her family from place to place as her father sought work. I remember her telling me of how she left school in Grade 4 after attending quite a lot of different schools. She never had a chance to settle anywhere as the family moved about every 3 months. Despite her lack of formal schooling, Margaret taught herself a great deal and I remember her confidently taking voluntary positions on committees as secretary, president and treasurer when we were in school. The family moved from the south of the state to Prossers Forest (north-east of Launceston) and it was here that Margaret met the large, happy and musical family of Blyths who lived at Patersonia and Myrtle Bank. 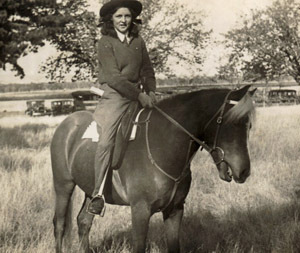 She used to ride her horse, Peter through the bush to go to dances and parties with Phyll and Dot Blyth. I suppose it was here that she first met my father Vin Blyth, I don't know how old she was then but they married when she was 23. 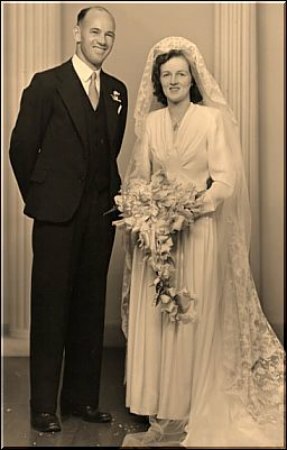 She joined the WRAAF for a short time and then in 1947 married Vin at a ceremony at St Andrews Presbyterian Church in Launceston. Launceston Examiner newspaper in February 1947. Silver sequins trimmed the waistline of the satin lined catelli gown worn by Margaret Isabel Ewart, daughter of Mr & Mrs H Ewart, Prosser's Forest, when she was married on Saturday to Vincent Alfred Blyth. Rev A. Thomas performed the ceremony at St Andrew's Presbyterian Church and Mr Ewart gave his daughter away. The bride wore a long lace veil which has been in her family for more than 100 years. Her bouquet was of water lilies and white gladioli. Miss Shirley Johnson was bridesmaid. Her frock of white marquisette had an off-the-shoulder neckline and her hooped skirt was trimmed with red satin ribbon. In her hair she wore a white halo of flowers and she carried a bouquet of red gladioli and dahlias. The bride's brother Mr H. Ewart was best man and Mrs C.P. Andrewartha sang "I'll Walk Beside You". When receiving guests at the reception at The Lounge, the bride's mother wore a black lace and silk frock and her velour toque was studded with gold. The groom's mother was a smart figure in a black and white silk dress. Her black hat was trimmed with white veiling. When leaving for the honeymoon on the North-West Coast, the bride changed into a pink linen suit trimmed with black. Her black velvet hat was trimmed with contrasting flowers and black veiling, and her accessories were black. Mr & Mrs VA Blyth will live at Echuca, Vic. The Belgian lace wedding veil that Margaret wore belonged to her great grandmother Elizabeth Barlow (nee Cooley). It had been worn by many members of the family before Margaret wore it in Feb 1947. I was the last person to wear it, that was in 1977. Click on the names to see wedding photos that I have. Peter Harold Blyth was born in Echuca, Victoria to Vince & Margaret Blyth. John Richard Blyth was born in Devonport, Tasmania to Vince & Margaret Blyth.